TRIPS: Free things to do in Tacoma, WA - C.R.A.F.T. Andy and I are on the very last leg of our road trip. At this very moment, we are in Shreveport, LA visiting with my grandparents! It’s been super fun, but sleeping in my very own bed tomorrow night will be pretty nice! 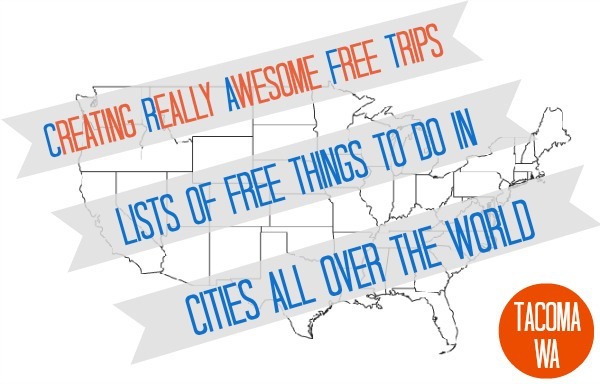 Have any y’all taken a road trip yet this summer and used any Creating Really Awesome Free Trips posts? Hello C.R.A.F.T. fans! 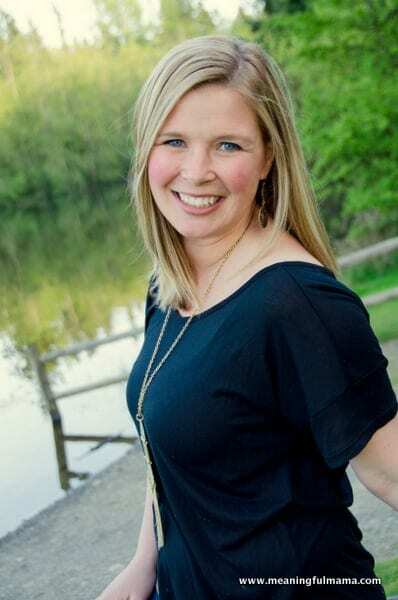 My name is Jodi, and I am the blogger over at Meaningful Mama. I met Jamie at Blissdom, and I have to say she is one of the more fun people I have met. She is also very talented, so I know why you are loyal to her site. When she asked me to join her trips series, I was excited to be able to show you around Tacoma, Washington. I was married 8 1/2 years ago and have been living in the area ever since. Tacoma is located about an hour south of Seattle and Bellevue. It is surrounded by the beautiful Puget Sound, many lakes and has gorgeous views of majestic Mount Rainier. Today I am bringing to you some wonderful FREE things to do in this exciting city. In a previous Trips series, Rachel from Holy Craft gave you her own tour of our fantastic city. What she presented are definitely the first ideas that came to my mind as well. 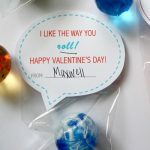 However, I didn’t want to give you exactly what she had already shown you, so I tried to think of other fun and free activities for you to enjoy. Many of these activities are geared toward kids because I generally have 3 little ones following me around. I thought these options might be helpful for families traveling to or living in Tacoma, but there are options for people of all ages. Let’s get started! 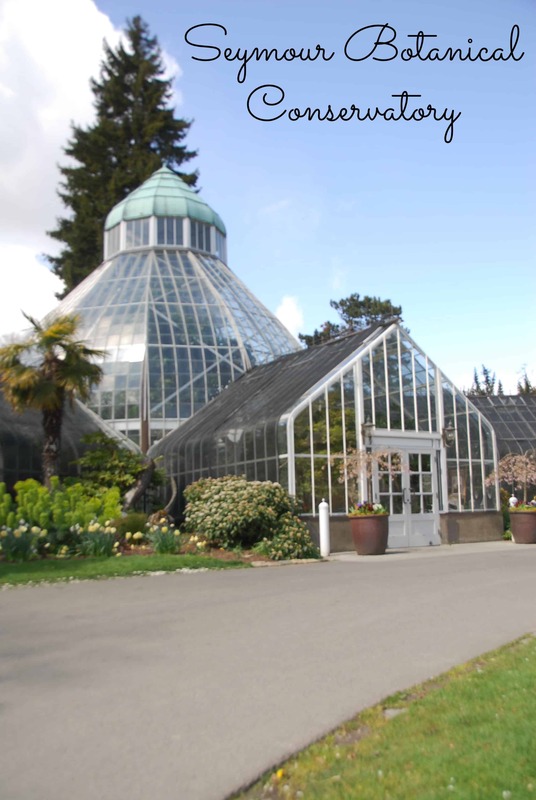 Seymour Botanical Garden is located above Wright Park in historic downtown Tacoma. This classic style conservatory houses an array of beautiful flowers and plants. The conservatory opened in 1908 and has received a few structural changes since but maintains the bones and integrity of the original structure. The conservatory was originally enjoyed by visitors who were able to see un-native plants from around the world for the very first time. Any lover of plants will continue to enjoy unique plants from all over the world that are kept in this conservatory. It’s a smaller building, but still is packed of surprises. Admission is free with donation encouraged. There is also a small gift shop within the conservatory. There is free street parking available, and I have been here a few times and never have had problems finding a spot. It is open from 10-4:30 every day, except it is closed on Mondays. 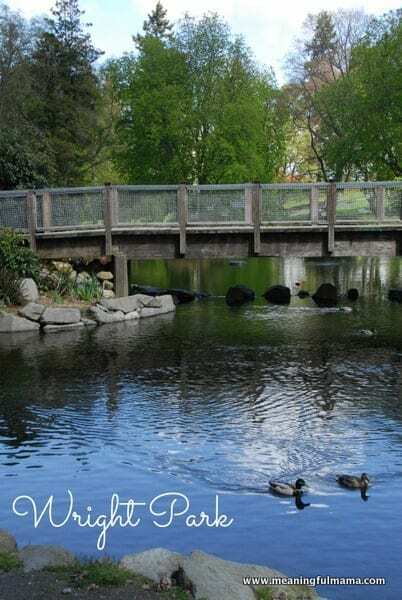 Wright Park is bustled in a neighborhood that has some of the historic buildings, homes in Tacoma and is conveniently close to two major hospitals in the area. I was actually married up the street and a lot of my wedding pictures were taken in this park. I also gave birth to my children in Tacoma General Hospital and had a view of the park, which makes it close to my heart. We did our first family photo shoot here after we had the two girls (our son hadn’t been born yet). 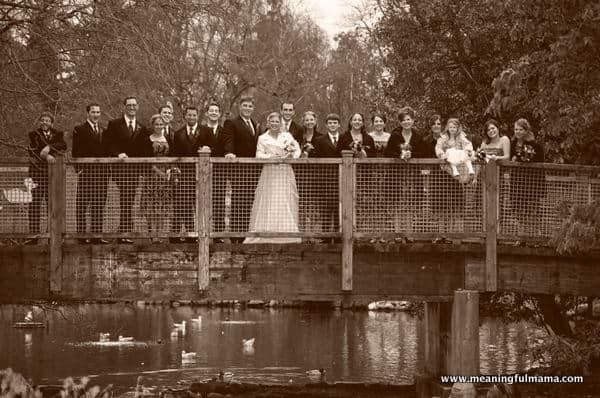 I can’t help but throw in a wedding picture taken on this bridge. This a very historical park. You will find statues and interesting plaques all throughout the venue. It would actually be a great place for a scavenger hunt with all the little treasures throughout. This park has it all. I went there more recently and discovered a brand new, large play structure for the kids. There is an interesting modern metal sculpture feature that actually is a water park when the weather gets warm. You can stroll down the paths or sit at one of the many benches looking out over the pond. There is plenty of grass, so it truly is a break in the middle of a fairly bustling neighborhood. There are even horse shoe pits if you want to get your game on. There are more than 600 trees in Wright Park, representing 150 varieties. Some of the trees have become “state champions,” being the largest known of their time in Washington. The park takes on new life with every season. The foliage in the fall and the bright colors of spring popping are my favorite times to visit. 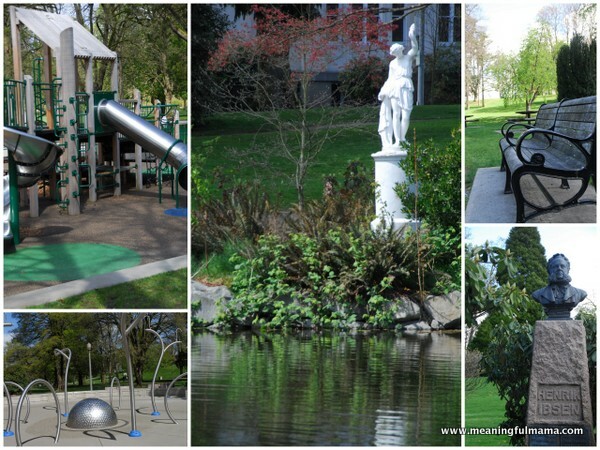 For more information on Wright Park visit the Metro Parks Tacoma web page. 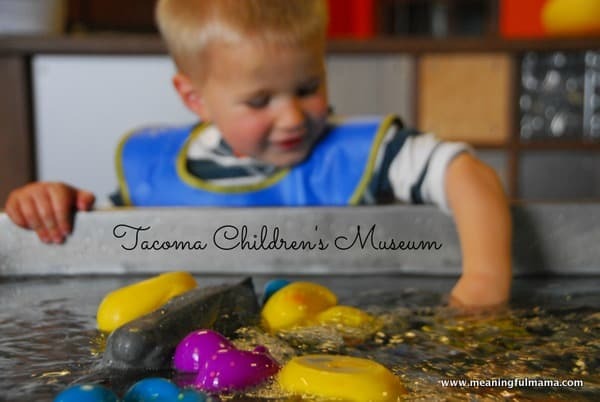 Tacoma Children’s Museum is actually in a newer and better facility. 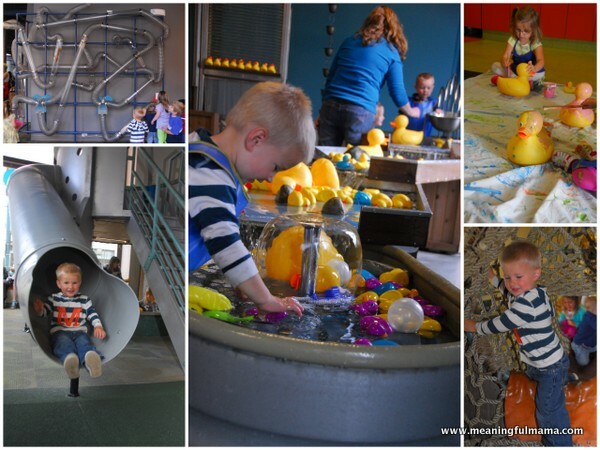 This was my first time visiting the new version, and they definitely stepped up the level of sophistication (funny word to use for a children’s museum) and enjoyment. The kids especially loved the water table area with water running along and loads of duck and other floating things to play with at the child-sized rivers. The other favorite (especially for my son) was the wind blowing tubes against a wall. 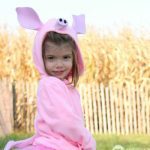 The kids could open up little doors and stick in scarves, balls or stuffed animals. The object would then quickly make its way through the wind maze and spit itself out of a few possible locations. It was fun to watch. There were a lot of places and structures to climb, experimenting along the way. A funny draw for my children was the old fashioned phones they had strategically place throughout the play area. They played with those phones in different locations throughout our visit. There is an art studio with a crafts and activities to do, and those are on rotation so you can come a number of times and always experience a different activity. My kids were able to use stamp pads and stamp rolls as well as paint ducks for their art experience. Donations are accepted at the door. Parking is free in stalls 1-10, but it is a first come first serve basis. I had to park on the street, but street parking in Tacoma is very reasonable. Please visit their website for all they have available – like Parent’s Night Out this summer. It is always fun to get local products at your fresh and inspired Farmer’s Market. Tacoma actually has three locations and times for their farmer markets. 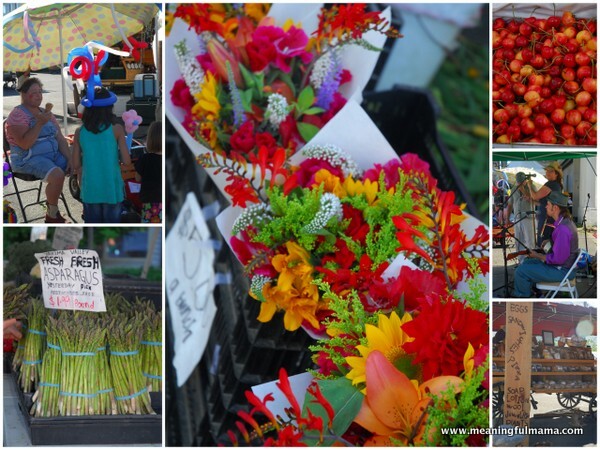 The 6th Ave Market (6th Avenue and North Pine Street) is Held on Tuesdays from 3pm-7pm and runs May-September. The Broadway Market (South 9th Street and Broadway) is held Thursdays from 10am-3pm and runs May-October. Finally, the South Tacoma Market (3873 S. 66th Street at the STAR Center) is open on Sundays from 11am-3pm and runs April-September. 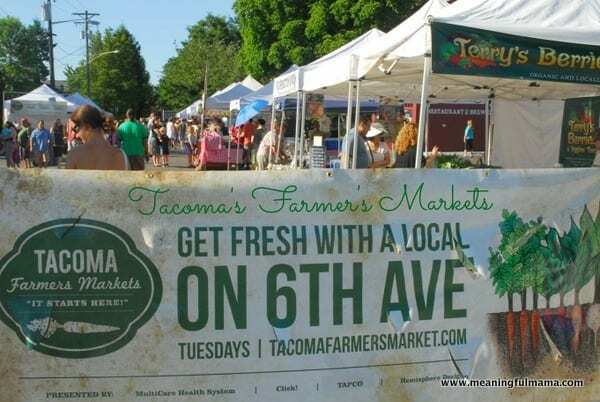 There are too many vendors to mention, but you can check out more information on the Tacoma Farmers Market website. There are always fruits, vegetables, flowers, performers, specialty desserts, and artisans of all types. It is a very family friendly environment. 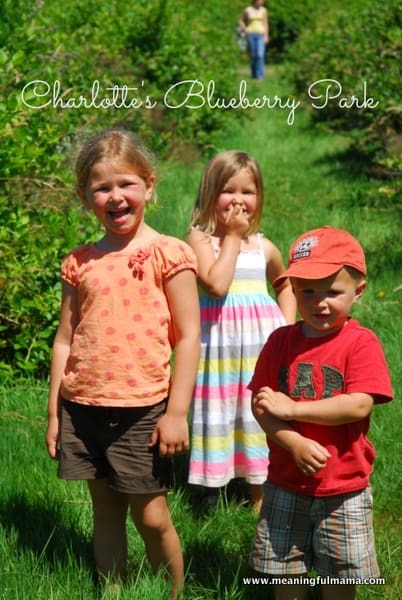 This was my first time at Charlotte’s Blueberry Park, and we were all utterly enthralled. We love blueberries in our family. I had heard it mentioned before and assumed it was a farm where you pick a bit and pay for what you picked. However, it was completely different. It is a park with blueberry bushes everywhere. You can pick as much as you want. I wish I had brought some sort of container for collecting them. Although it was early in the season when we visited, I’m sure we still could have filled up a good bucket. People were walking around with milk jugs and collecting them that way. You could tell they were going to all turn purple over the next couple of weeks. There were still plenty to pick, and we all got our fill as we walked around part of the park. One guy there said some people bring flats and pick all day long. The park began as a farm in 1929 and was 53 acres. Tacoma School District purchased it to build a school in 1968 but that never happened, and they ended up selling 20 acres to Metro Parks. 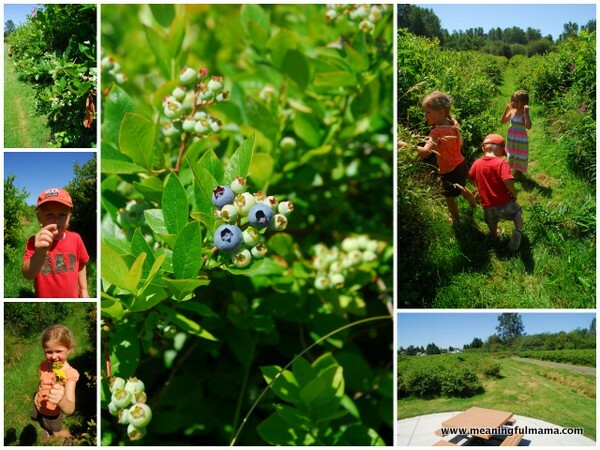 The neighborhood started to care for the park and maintain the 4000 blueberry bushes. Volunteers still take care of the park grounds today. Picking season runs from July until October, and they have 5 different varieties. There is a trail circling the park that is .6 miles long and is a great place for a walk or jog. Parking is on the street and easy to find. 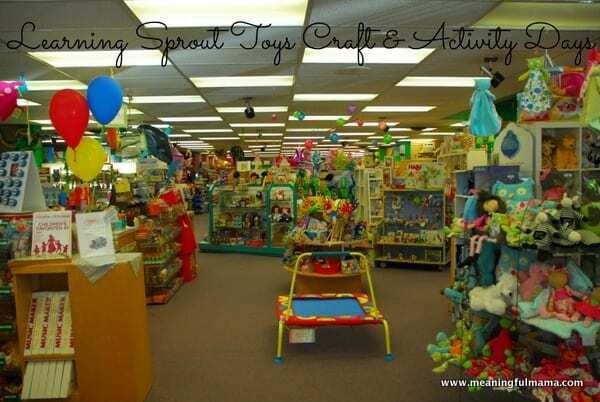 Learning Sprout has to be the most fun toy store I have ever been to. 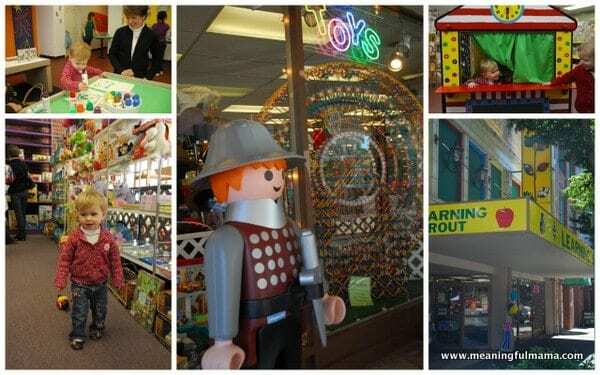 We have been there so many times just wandering the store playing with items. Things are set up so you can actually play with toys in the store. They have so many fun and unique products. There are toys that will be nostalgic, and there are more modern toys as well. The quality is amazing. They also have a section for any teacher or homeschooling mom. Another great things about the Learning Sprout is they have free crafts and activities the first Saturday of every month. It is a drop in time between 10 and 2. I have pictures on this post of when we went with Abby when she was younger. We have gone other times but haven’t been as diligent at taking pictures. They also do birthday parties and have “play days.” Please visit their website for more details. There is street parking, but you will need to fill the meter for that. 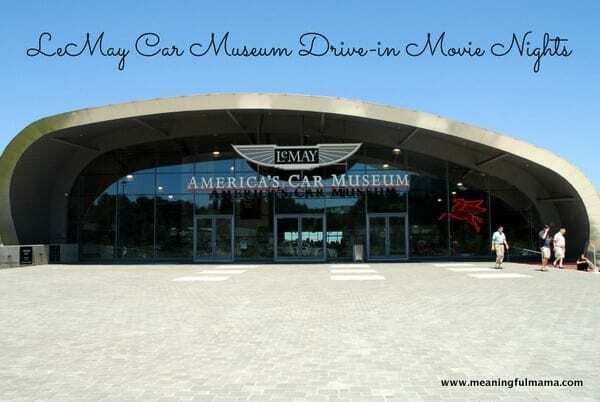 The Lemay Museum is an amazing car museum housing some really cool vehicles. It does cost money to get into this museum and see all of the cars in the collection. 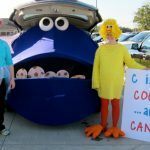 However, they are hosting Drive-in Movie nights this summer, which is a lot of fun. You missed June, but other dates comping up are July 13th and August 17th. At noon they will have a zip line that costs $5. At 4:30, you can come and park and picnic. They will have a free inflatable bouncy house at that time. Starting at sunset, the movie begins. They will be showing the Flinstones in July and the Love Bug in August. The museum actually houses the Flinstone car from the movie. It’s so wonderful that the museum provides such a fun family activity for free. Chamber’s Baby Loop gets honorary mention because it is not technically in Tacoma. It is on the outskirts of Tacoma in a town called University Place. 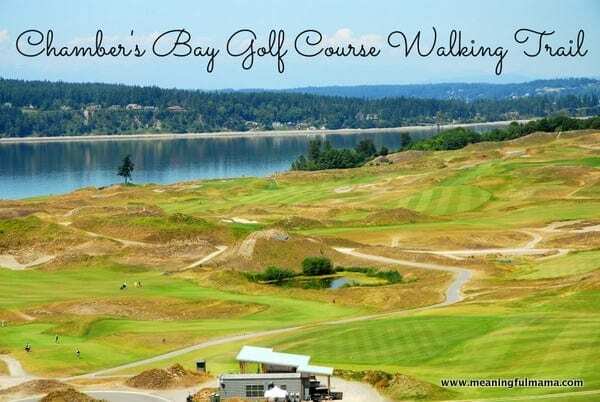 Chamber’s Bay Loop circles around and winds through the Chamber’s Bay Golf Course. This is the future site of the US Open in 2015. 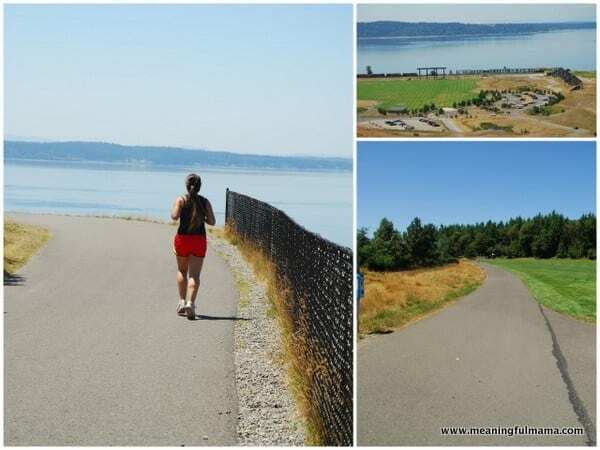 With sweeping Puget Sound views, you will enjoy your environment while you get some exercise. The trail around the course is 2.9 miles long. It is placed on a hillside, so as you travel down one side of the loop, you can anticipate a steep elevation change on the way back. It has an elevation gain of 315 feet. I remember walking Chamber’s Bay when I was 8 months pregnant with Abby, and it was definitely a killer. I’ve also done it with a double stroller, and it is quite a work out. I traded off pushing with my sister-in-laws who I was walking with at the time. There is a small park at the top of the hill for kids to play. There are also a few nice restrooms available as you are walking as well as picnic benches and drinking fountains. It is a paved loops, which makes for friendly walking and no twisted ankles. Dogs are allowed on a leash. Parking is available on the street and there are multiple entry points along Grandview to the path. I hope you have enjoyed my tour of the fun and free activities you’ll find in Tacoma, Washington. 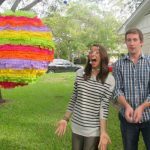 Be sure and check out Jodi’s awesome blog for more fun ideas! Glad you liked the list, Kayla!